Many of my customers have come to me, wanting advice on which of our many block planes they should buy. Often this is prefaced by the fact they want to know this plane will provide a great deal of functionality, as this may be the only plane they purchase. 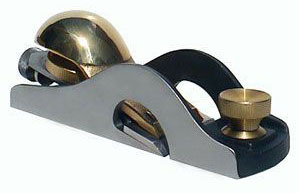 With that in mind, I often suggest our Low Angle Rabbet Block Plane. When you first see this plane, you’ll notice it looks a little bit different from the majority of our other block planes. Just in front of the bronze cap, there is metal (on both sides) in the shape of what almost looks like a half circle. Since the blade on a rabbet plane reaches the full width of the plane (plus about .005”), this unique structure is the most efficient way to attach the front section of the plane. This block plane will obviously perform admirably in most of the “normal” uses, such as taking wispy thin shavings from long grain or applying a quick chamfer. With the low bedding angle, it can also handle end grain quite well, too. Now since the blade reaches all the way to the edge of the plane body, you can also use it to clean up rabbets and tenons. (A rabbet is a groove cut at the edge of a board, often so another piece of wood will fit into the removed section.) When working on rabbets or tenons, the blade should be set exactly flush with whichever side of the plane will be doing the work. This is so the plane will remove material all the way up to the mating edge, without scoring the connecting face. A quick and easy setup method for this is to lay the plane on the side which will be used. Slightly loosen the spin wheel and gently press the opposite edge of the blade, while keeping the side of the plane flat, so the side of the plane and the blade line up together. Don’t forget to re-tighten the spin wheel before using the plane. Always remember to sharpen the blade on any newly purchased tool. We grind the blades to 400 grit at the factory, but a quick honing to 8000 grit will make your tools work so much better. Feel free to take a look at our sharpening demonstration on Youtube, or stop by any of our events, and we’ll be glad to show you in person. One caveat I like to bring up, especially for those who may not have any other planes. Do not use a rabbet plane on a shooting board. The small band of metal on both sides of the blade on regular planes is what prevents those planes from continually cutting into the shooting board. Since the rabbet plane’s blade is full width, it would destroy the shooting board. I recently bought this plane primarily to use on fine tuning tenon cheeks, works wonderfully! For a long time now, I have used the older version of this plane, it lacks the Nicker, no matter, I found that this plane is one of my go-to tools, using it on many projects. I highly recommend this plane to anyone. It should be one of the first hand tools to buy for anyone starting out in wood working. It is one of the most versatile planes, able to do multiple functions from fine tuning tenons, to fine surfacing case parts, doing the job that normally a specific plane would be used. It is well made, its blade holds a razor edge, and more importantly, it works–a joy to use, having nickers provides added ability. I have the older version of this plane and I use it more than I use any other plane I own. It lives in my apron. What a satisfying tool to pick up and use. My only complaint, if that’s what this is, is the non-adjustable mouth was set too fine and I had to open it up 1/64 of an inch. This plane gets rough use. I take it to lumber yards to ascertain the character of figured boards, it’s in and out of my apron many times a day, has been dropped multiple times, is scratched, marred, shows it’s use. For our friends from across the pond, this would be known as a rebate plane. I’m looking for a Lie Nielsen sqew block plane. It that just another name for a block rabbit plane?